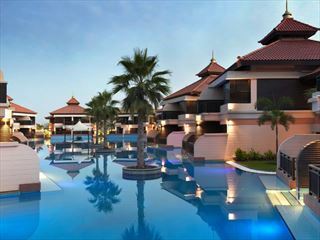 Tropical Sky are delighted to announce the introduction of the Hilton Ras Al Khaimah Villas to our Middle East programme. The resort is situated on a beautiful 1.5km stretch of beach and has an impressive range of facilities including 6 swimming pools, 13 different dining outlets and bars, tennis, fitness centre and water sports. including the one with slide. 2 Boadrooms with capacity of 20 seats & multi purpose room seating 80 pax. Children can enjoy the 250 m2 Kids Club with indoor play rooms (divided in particular age sections), garden, outdoor playground, kids pool with water slide, supervised games and babysitter available in the Hilton Ras al Khaimah Resort & Spa. international favourites as well as local specialities in buffet style. Maarid Restaurant is open for breakfast, lunch and dinner. Pura Vida is the South American Steak house, located at the water breaker terrace. Offers selection of cool refreshing Ceviches and incredible Churrascaria experience. Turn the colored wooden signal on your table to green and smiley team members or Gauchos appear with titbits cut straight from the rotisserie. Passage to Asia offers a dazzling Asian experience of tropical flowers, exotic herbs and spices. Japanese, chinese and thai cuisine including sushi counter. 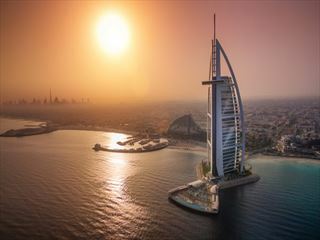 A choice of indoor seating and outdoor terrace overlooking the Arabian Gulf complements with a perfect evening. 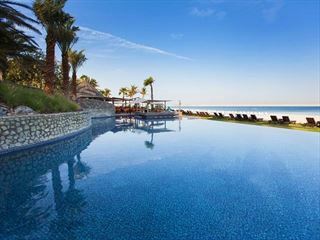 Al Bahar – all day beach restaurant serving delicious BBQ lunch as well as a la cart snacks. After sunset Al Bahar is transformed into a fish restaurant with underwater view. Dhow beach bar – situated on the villas side this all day snacks bar & restaurant is a perfect place to enjoy a splendid gulf view having a glass of chilled wine. Offers mediterranean dishes menu, refreshing cocktails and speciality coffee coolers. Dome Lounge – perfect place for afternoon tea and pre dinner refreshments located in the lobby overlooking the resort beach. X.O Bar – one of the Resort night spots serves young and aged spirits , classic cocktails and cigars in a relaxing intimate atmosphere. Has mix of arabic & contemporary decoration together with its grand collection of whiskey, fine spirits, wines and live entertainment. Rio Bar – located 2 m away from the seashore serves an extensive selection of exotic cocktails, fruit juices & chilled drinks. Sunset bar – place where you can just swim in or lounge around the pool side with an ice cold smoothie or fresh fruit juice. For summer time & till now serves Hilton classics and small snack menu. 6 Degrees – very stilish shisha bar situated just below the Lighthouse at the Waterbreaker. Has a beautifull panoramic Gulf view. Serves selection of drinks and refreshments. Esptrit – lively bar and disco for the young at heart, screening major sports events, hosting pool and darts competitors, playning dance music and serving trendy cocktails and fine wines.